Today, Alliance is a leading manufacturer and service company, specializing in Regenerative Thermal Oxidizers, designed for the destruction of Volatile Organic Compounds (VOCs). When it comes to RTOs, we are the experts. We understand the user’s requirements for uptime, and it is reflected in our systems through superior design and the use of the highest quality components. This practical approach has enabled us to produce a line of RTOs that are compact, robust and trouble-free. RTOs are all we do. This approach has helped us to develop an outstanding reputation for exceptional value, quality, reliability and most notably, expertise. See a World Map of Alliance RTO installations. Contact us to learn more. You can also complete our online quote request form and one of our team members will get back to you shortly with details. We thank you and we look forward to helping you with your facility's pollution control solutions. Alliance Corporation is a US based company dedicated to building the best Regenerative Thermal Oxidizers (RTOs) in the industry. 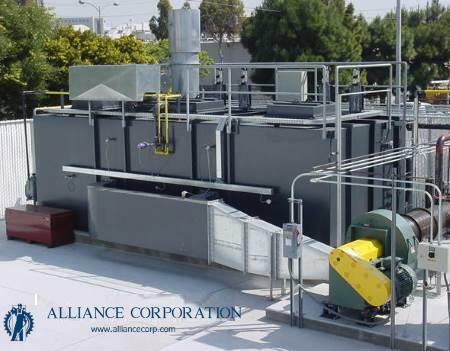 Alliance Corporation was founded in 1996 as a service company specializing in Regenerative Thermal Oxidizers (RTOs). It became clear to us that many existing air pollution control systems were being neglected by the original manufacturers. Alliance Corporation’s ability to quickly diagnose and resolve problems enhanced our reputation in the industry. Over time, we began to manufacture a line of reliable RTO systems under our own Alliance brand. We are a very technical firm, focused on our products and service. Our primary source of new business is by referral and this speaks volumes about the quality of our equipment and service plans. This approach may not ensure rapid growth, but it does ensure that we maintain an outstanding reputation with our steadily growing customer base. This well-earned reputation for exceptional system quality provides extraordinary value for our clients.